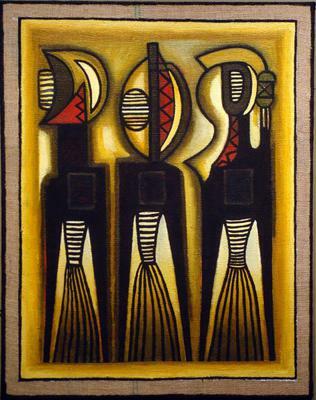 Ephrem Kouakou is one of the world’s foremost African painters. 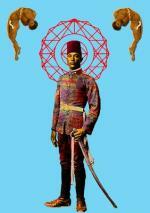 He currently resides in Baltimore, Maryland, and Ivory Coast, West Africa. His powerful, vivid paintings are in the collections of The Metropolitan Museum, New York, the Smithsonian National Museum of African Art, Washington DC. and Fondo Del Sol Museum, Washington DC. 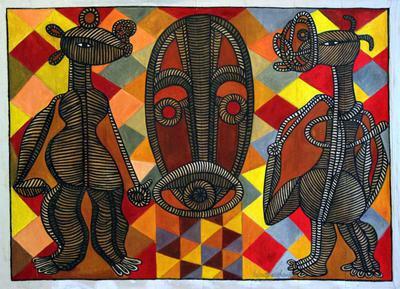 He is noted for his bold blending of indigenous African visual sensibilities and folk motifs with Western creative techniques. 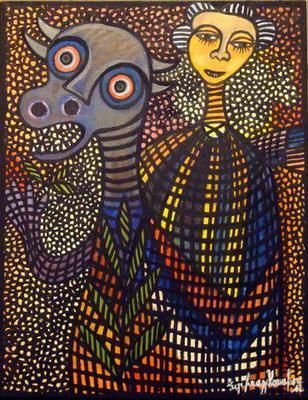 Born in 1962 in the Ivory Coast village of Toumodi, Ephrem is a member of the Baoule group of the Akan people. As a young man he trained to be a medicine man, participating in many initiation rites. This actualized a deep spiritual life that manifests in his work. Themes of community, the spiritual power of masks, protective spirits, and animal guides, are reflections of an unseen world that brings a deeper meaning to our lives. When he was 17 years old, Ephrem walked over 2500 miles from his Ivory Coast village to Algeria, a journey which took over three months. He then made his way to France, where he studied at France’s best art academies, including L’Ecole des Beaux Arts, Angers (1981-1982), Ecole des Beaux-Arts de Aix-en Provence, (1982-1983) and École Nationale Supérieure des Beaux-Arts de Paris (1984-1986), where he graduated with honors. His works on both canvas and paper are noted for their highly saturated, intense color, achieved by mixing raw pigment powders into glue. 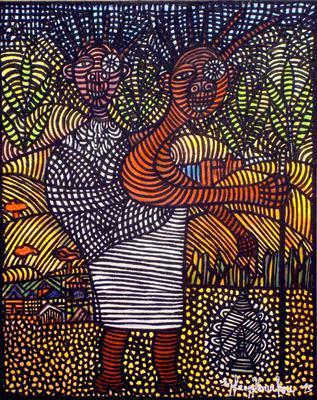 Kouakou has exhibited in galleries and museums internationally including France, Belgium, Switzerland, and the United States. He is currently represented by Still Life Gallery in Ellicott City, MD.